The camera I use in shooting the tutorial is my Elph. I also use my digital camcorder on occasion. Look at all that they have and buy the cheapest one that will be relatively steady. You should shoot with the timer on the camera so steadiness is not that critical as you won’t be touching the tripod while the shot is being exposed. ½” pipe clamp heads and a 60” length of black pipe creates these versatile clamps that have about a million uses besides model photography. These are the verticals for mounting lights in our lighting setup. 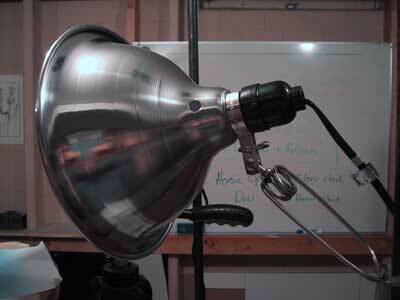 Cheap aluminum clamps lights with shades. The shades help focus the light on the model and the matte aluminum finish helps to diffuse the light and eliminate hotspots. These bulbs are quite good at simulating daylight. They are cheap and replaceable. They do have a noticeable pinkish hotspot, but rotating the spot off your model is pretty easy and it doesn’t show up much against the background. 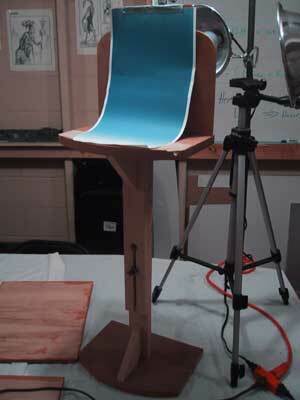 I built this so I had a stable platform to shoot models on. 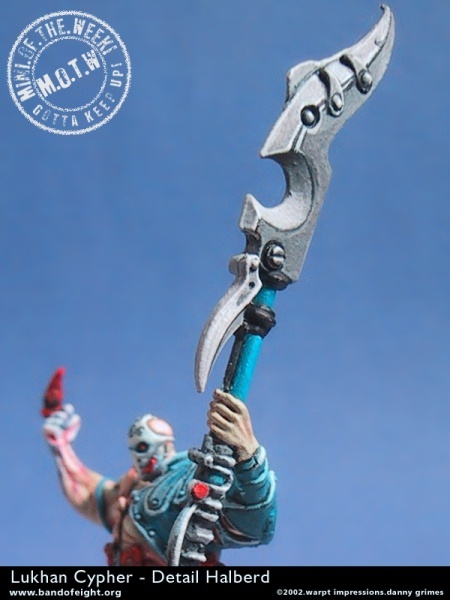 I wanted it wide enough that I could move the model all around to get the right angles. I curved the leading edge so my camera/tripod could move around it easily and still maintain a 4in macro range. 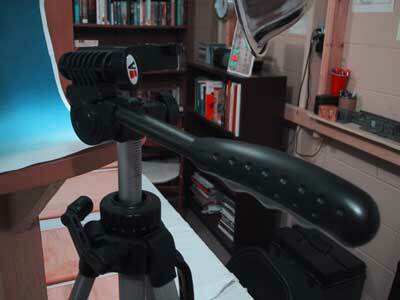 Another tripod with the L-shaped piece attached to the top would work well too. 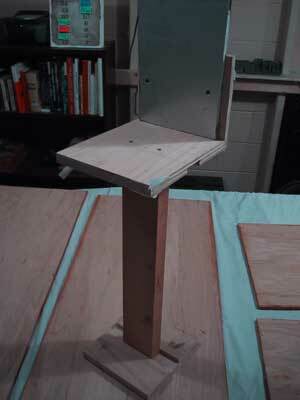 Base can be a piece of plywood (12”x12”), vertical can be a 2x4 (24”-36”) and the L-shaped top two more pieces of plywood (8”x8” each). Glue the base onto the end of the 2x4 and run a couple of 2” drywall screws through the base and into the 2x4 to secure it tightly and let dry. Glue and screw the L-shaped piece together and let dry. Glue and screw the L-shaped pieced onto the top of the 2x4 and let dry. Voila! Instant model stand. Get as fancy as you like, but here is the most basic version. Use your image editing software to create a gradient that is full page sized to print out as a backdrop. I like blue because it tends to brighten the appearance of the photo, but you can use whatever color you like. 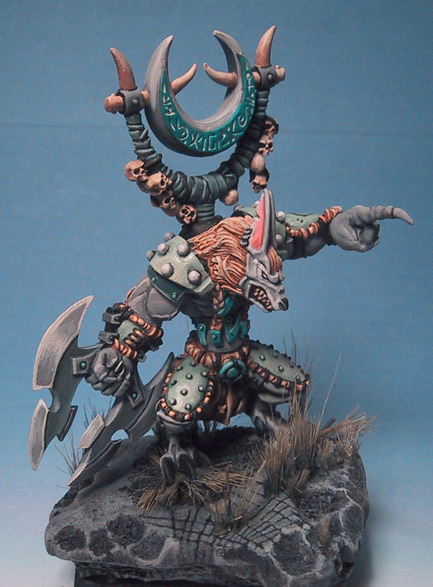 I would avoid reds, oranges or other super bright colors as they may distracting from the model. My gradients run saturated blue to white on an 8.5x11 sheet (11x17 is better, but my printer won’t do it). The top 25% is pure blue, the bottom 25% is pure white and the middle is a gentle gradient. Print this on good matte paper or card stock and it will last a long while. Tip: If you know someone with a color laser printer or Fiery printer at work, ask them to rip one for you. These printers can usually handle 11x17 paper and print at a much clearer quality. 1. Find a open place to work where you can connect to power easily and without tripping over a bunch of wires. Trust me. When you snag a cord and it brings down your lights, camera and painstakingly painted models you will curse, LOUDLY. 2. 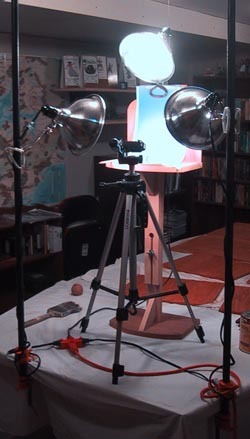 I use the end of a table and place my tripod as close to the edge of the table as possible and my model stand just beyond that. I put pipe clamps on either edge of the table and tighten them down securely. 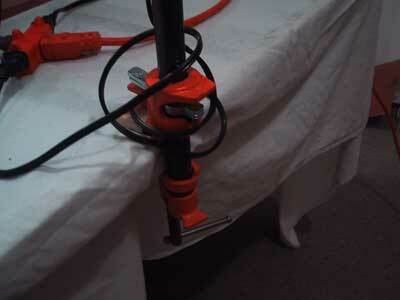 Attach the clamp light to the upright pipes. 3. Adjust the lights to flood the area with light. It will look really bright but trust me too much light is rarely a problem as long as you adjust the exposure on the camera to compensate. 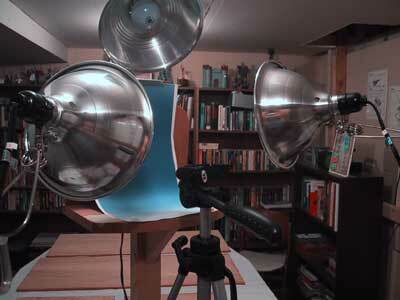 With this setup I am still setting to a positive value for exposure. Just goes to show that as bright as this seems…it ain’t that bright. 4. When taking your shot dont worry if it does not fall dead center in your screen. You will probably crop the photo in the end. Try to think of the cropped shot you will end up with and try to take the best framed shot of that. 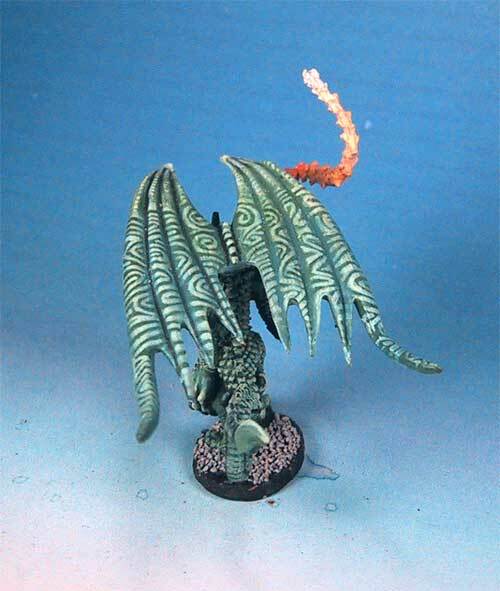 This is easier on colored backgrounds than on photos or landscapes as things do not need to line up. Practice and learn. Place your model and line up the preview screen. I never use the viewfinder. Mark the stand where you model is placed. This makes it easy to remove your model and then place it back at the same point. A number of issues might arise that cause you to move the model: shadows/hotspots, dramatic angle, autofocus sensor not aligned, etc. 5. Set your camera to macro mode, turn off your flash, check your exposure settings, frame your model, set the timer, take your shot. Ahhhhh Art....Now it belongs to the ages! Macro - 4in this is more than enough for amateur model photography. Serious photographers will disagree, but the point for me it to get good shots on the cheap. Exposure – Experiment, you’re not paying for film. Your camera is bound to be different than mine. If you have an Elph I set mine to 0/+1 and I still do a little correcting in Photoshop (which I will detail below). Just to reiterate: In really bright light (daylight) you will want to set a negative value in the exposure setting to allow less light onto the CCD (the digital equivalent of the aperature). In dim light you will want a positive value number to allow more light in. Auto Focus – Use it. Most low end cameras will not give you an option of manually focusing anyway. The way this works on my cam is that an autofocus sensor projects a light to gauge the distance from the lens aperture to the model. 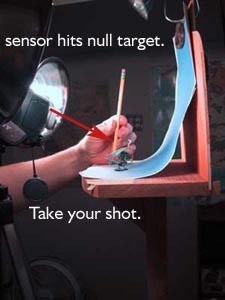 This sensor is offset from the lens, so sometimes it does not hit the model but passes by it (above left or right). What this does is cause the camera to focus on the background which leads to really blurry pics of the subject model. You can handle this in two ways. 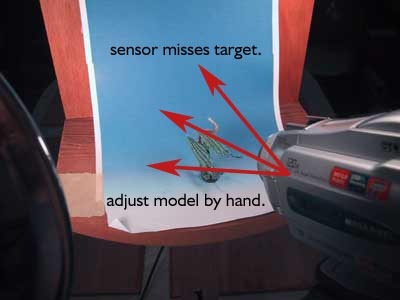 Method One: move your model until your light sensor is flashing visibly on the model (or even the particular area of the model that you want to be in the absolute sharpest focus). 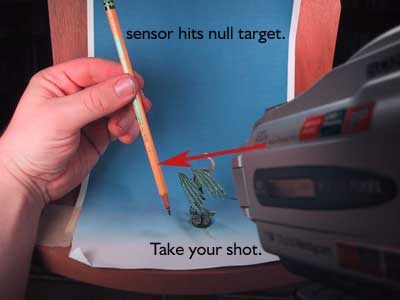 You may need to turn your light off and take a test shot to be certain where the sensor is flashing. This works in 99% of all cases. Method Two: use another object (a pencil works well) and place it in your shot next to the model, in line with the sensor light and in the same plane as the model. This method is trickier but fools the autofocus into adjusting to the same depth of field as your model and results in clean, clear photos. In photoshop you will need to paint this object out, which takes patience. This method is a last resort as it requires the additional photoshopping. I took these shots with this setup. For not much money I think they are pretty crisp and have a decent depth of field. Hope that this helps and thanks to others that have helped me!